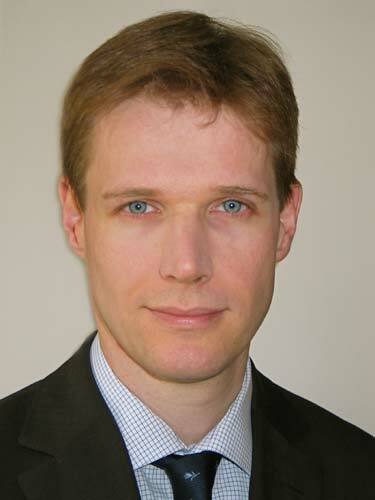 By Aymeric Poizot, Managing Director, EMEA Fund and Asset Manager Ratings, Fitch Ratings. Asset managers are facing a difficult environment. In order to compete in Europe, they will have to focus on the areas where they are credible, demand is sustained and performance expectations are high. They will need to strengthen their key areas of expertise, scale down or outsource other areas and expand in neighbouring activities while investing in new areas. Fitch believes capital markets and investor demand will be driven by structural forces over the next few years. These include bank disintermediation, Solvency II and derisking, and globalisation. 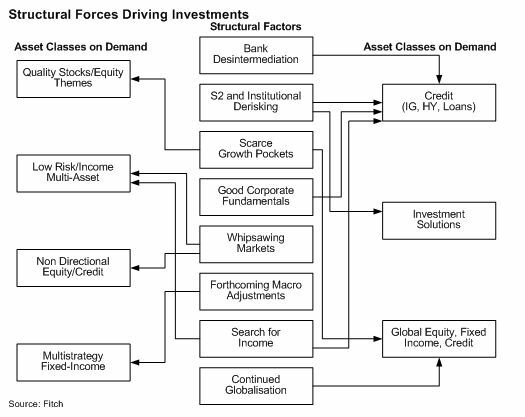 As a result, the asset classes and investment strategies likely to be favoured include credit; global equity, global fixed income, global credit; investment solutions; multi-strategy fixed-income; non-directional credit and equity (eg market neutral); low risk/income-oriented multi-asset; and equity themes. European institutional investors are now de-risking, while seeking out yield to meet commercial or actuarial targets. Credit is particularly appealing to institutional investors, while insurers favour investment grade corporates and pension funds target high yield and emerging markets, at the expense of equity. Sub-asset classes, such as inflation linkers, tactical asset allocation funds, infrastructure or cash are benefiting from some institutional interest, notably from Dutch and UK pension funds and continental European insurers. Managers that are not well positioned on credit – notably specialties (high yield, short term, emerging markets) are likely to lose institutional market share. As investor demand will focus on income generation, global products and moderate volatility products, Fitch anticipates limited growth in the core assets of domestic equity and government bonds. While investors will maintain a reasonable allocation to such assets, they will become more receptive to switching to passive strategies, or to managers with stronger track records, an active management style and diversifying profiles. Competition for such assets will be intense. We expect to see European asset managers re-shaping their activities in three key ways: strengthening their key areas of expertise; scaling down or outsourcing others areas; and expanding in neighbouring activities while investing in new areas. To be successful, investment strategies where demand is anticipated and where the manager is credible, will require strengthened resources (front office, commercial, product specialists, staff with international profiles); increased critical mass (by merging funds, using master feeders, moving client money); heightened commercial efforts (referencing, distribution, communication, ratings); and adoption of international standards (funds’ benchmark, product name and domicile). Conversely, investment strategies where demand is expected to be weak and/or the manager lacks credibility will need to be scaled down, either by closing funds, outsourcing management or by using funds of funds or funds of mandates. In order to remain competitive, asset managers in our view should not hesitate to expand into “neighbouring” activities, despite the resource and process adjustment this requires. For example, a high yield manager may consider expanding into loans, or a loan manager into high yield, as the issuer pool is similar. Likewise, moving into the diversified income space is a logical progression for a European equity manager, given the overlap between large-cap stocks and investment-grade credit issuers. Such a development would require the recruitment of bond portfolio managers and the set-up of a top down allocation process. Long only stock and bond pickers are also well placed to navigate sideways markets by developing absolute return offerings. Bank deleveraging and globalisation should also benefit the European asset management industry. The European banks’ deleveraging process is expected to generate market financing needs representing roughly 10% to 20% of the current European investor asset base (pension funds, insurance companies, mutual funds), New areas of growth fuelled by these factors include: global equity or bond products; emerging markets; senior secured high yield; direct lending; and real assets. Many of these are new to asset managers, who must develop scale and credibility if they wish to successfully compete in these areas. Yet in most cases, doing so demands serious investment in terms of local analysts, sourcing channels, and technical and legal knowledge. Fitch believes that acquisition and team lift out are the only viable options. However, developing new activities, for example in global equity or senior secured high yield, requires significant investments in terms of personnel and/or acquisitions. Managers unwilling or unable to commit in these areas now may find themselves less able to compete in the near future.